The New Mexico State softball team went 1-2 this weekend as the Aggies welcomed Oklahoma, Ball State and Boston University to Las Cruces for the Troy Cox Classic. The Aggies were supposed to play a total of five games over the weekend, but weather conditions forced the first day of the Troy Cox Classic to be canceled. This turned the five-game tournament into a three-game tournament. The Aggies opened up the weekend against the Ball State Cardinals. Samaria Diaz started in the circle for the Aggies and had her stuff working early in the game as she breezed through the first two innings. New Mexico State got the scoring started in the top of the third inning with an RBI double by Fahren Glackin, who brought in Jeanelle Medina all the way from first. Glackin was able to advance to third on a throw from the outfield trying to get Medina out at the plate. The very next batter, Kelsey Horton, hit a sacrifice fly to left field that allowed Glackin to score from third base. The two-run Aggie lead soon disappeared in the bottom half of the third inning. Samaria Diaz got two quick outs, but then allowed the third hitter of the inning to get on. The next two batters each blasted a home run that gave the Cardinals a one-run lead. After the third inning, both pitchers settled down and did not allow another run between them. Ball State got the win over the Aggies by a score of 3-2. The next game for the Aggies was against two-time defending national champions the Oklahoma Sooners. Kayla Green got the start in the circle for the Aggies in this one. Green faced early trouble as she quickly found herself with the bases loaded and no outs. She was able to find her groove and came out of the inning allowing only one run. The Aggies could not get anything going against Oklahoma pitcher Paige Parker. Rachel Rodriguez got the only two hits for the Aggies in the game. Green would only allow one more run in the game and the Aggies would fall to the Sooners by a score of 2-0. “I feel like to have the courage to go up against some of the best hitters in the country, it gives our team a lot of confidence to know that they’re going to keep us in ball games,” Coach Rodolph said about the starting pitchers, Kayla Green and Samaria Diaz. The Aggies closed out the tournament against Boston University, who the night before beat Oklahoma 4-3. Kelsey Horton led off the game with a solo blast to center and, after one batter, the Aggies found themselves leading 1-0. The Aggies were able to string a few more hits together and Glackin got an RBI single that scored Rachel Rodriguez. Kayla Green got her second straight start in the circle for the Aggies. In the bottom half of the first inning, Green again found herself in a bad situation. Green was able to get out of it without surrendering a run. She had help from catcher Nikki Butler, who was able to pick off a runner heading back to third base. Boston was able to get a few runners on in the bottom of the fifth inning and eventually got one across the plate on an RBI single by Madi Killebrew. With the score at 2-1, Boston had a runner at second base with two outs and was able to get a hit to left field. Amy Bergeson threw out the runner advancing home to maintain the Aggies one-run lead. Green was able to hold Boston in the sixth inning before she got replaced by Samaria Diaz with one out in the seventh inning. 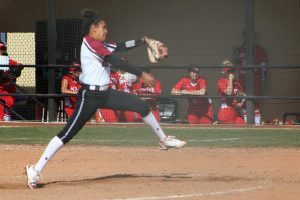 Samaria Diaz earned the save with two quick outs and the Aggies ended the Troy Cox Classic with a 3-2 win over Boston University. The Aggies are back in action on Feb. 20 as they head to El Paso to take on the UTEP Miners.